When the ribbon was cut for the grand opening of the BP Heron Center for Environmental Education at Birch Bay State Park on July 25, it was a moment of triumph for a group of dedicated parks supporters and volunteers who persevered in their dream to build an interpretive center befitting the majesty and natural beauty of Birch Bay State Park. The new BP Heron Center for Environmental Education will be the stage for high-quality interpretive programming at the park, giving local school children a place to gather and warm up after blustery beach walks, and public a new facility in which to learn from park rangers and local experts about the abundant wildlife in the Birch Bay ecosystem. 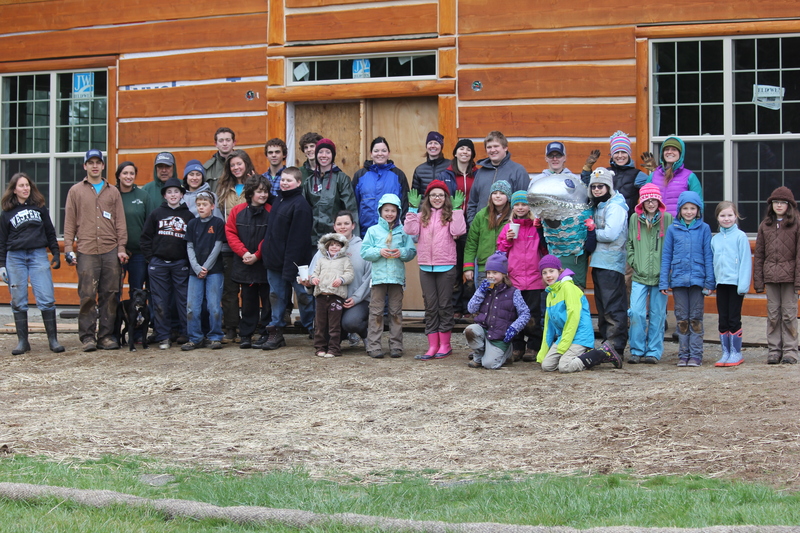 The grand opening was the first opportunity for the public to enter the new True Log Homes-designed structure. When not in use by organized school groups and interpretive programming, the facilities are available by rental to the public for picnics, reunions and other events. Proceeds will be used to maintain the facility and to fund enhancements to future programming. The Friends of Birch Bay State Park and BP have long partnered to provide free interpretive and cultural programs during the park's busy season from May to September. This new facility will increase options for programming, including opening up a classroom setting right on the beach alongside Terrell Creek Marsh, one of the few remaining saltwater/freshwater estuaries in north Puget Sound, and allowing our programs to continue through the winter months. The concept was conceived 10 years ago, when former BP employee and Port Commissioner Scott Walker and Park Manager Ted Morris thought Birch Bay State Park should extend its high-quality environmental programming to the surrounding community, and needed a building suited for that purpose. Together with a dedicated group of park supporters including Kathy Berg, Doralee Booth and many others, they hatched a plan to create a new facility that would inspire visitors and residents with an appreciation for the natural and cultural heritage of Birch Bay. Construction began in October of 2013 and was completed this July. The project would not have been possible without the generosity of many. Financial contributors to the project include BP at $115,000; Alcoa Intalco Works at $25,000; and Jerry Larson, who donated $5,000. Mills Electric donated more than 175 hours of electrical contractor time and thousands of dollars of donated electrical equipment. 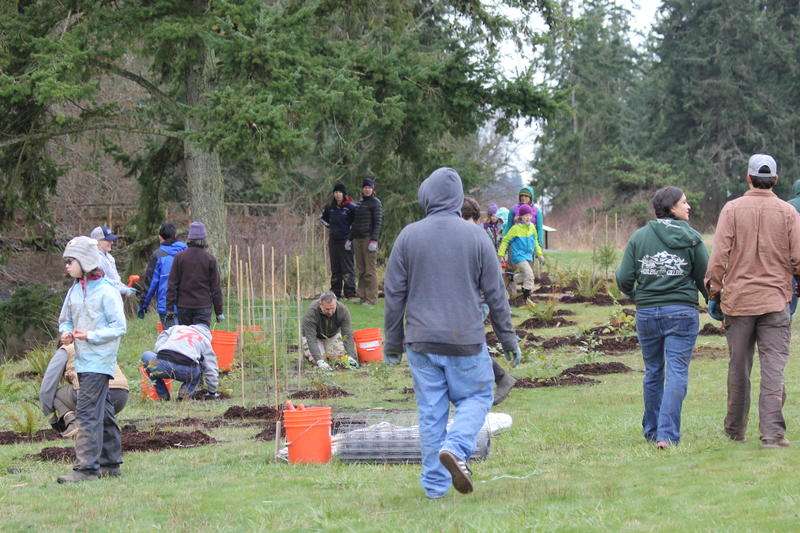 The Nooksack Salmon Enhancement Association donated plantings and hosted a work party with more than 100 volunteers. Washington State Parks provided the archaeological survey and contributed staff time toward the project. BAI Environmental provided hydroseeding of the surrounding landscape, and park neighbors Gene Quinn and Neil Cronk each donated about 500 hours of construction labor to see the project through to completion. So far this summer, more than 1,000 people have attended programs at the park. With more than 750,000 park visitors each year, the BP Heron Center is certain to enhance the experience of park-goers and attract new users. Thanks to the dedication and generosity of the project's champions, the BP Center for Environmental Education will be there to enjoy for years to come. On Saturday March 22nd, a group of 37 community volunteers gathered at Birch Bay State Park to give their time and plant native trees and shrubs along Terrell Creek. Terrell Creek originates from Lake Terrell and flows out to Birch Bay passing through agricultural and developed lands. Improving riparian habitat helps salmon and the ecosystem as a whole in several ways. Increased shading over creeks keeps water temperatures cooler, which salmon are best adapted to. The roots hold together the soil, decreasing erosion and turbidity in the water. Plants slow down the overland flow of water and runoff, reducing pollution in the waterways and increasing groundwater recharge. As restoration continues in the Terrell watershed, we hope that individual projects will meet up, creating a healthy riparian corridor with improved habitat for salmon and all the other organisms sharing the riparian zone. NSEA will be holding another work party this spring in the Terrell Creek watershed, on April 12th. Have you noticed the construction on the beach level at Birch Bay State Park? After close to a decade of planning and preparing, a dream is finally coming true. On April 20, the Friends of Birch Bay State Park finally broke ground on the space designated for the new BP Heron Center for Environmental Education. The 2,400-square-foot structure will be used as an interpretative center and community meeting place. It will be built at the park’s day-use area. “Thanks to the Friends of Birch Bay State Park, this project did not stall,” said Stacey McDaniel, BP Refinery Manager. Construction for the center’s log cabin is expected to start in late September and be completed by spring or summer 2014. “We hope to have it all sealed in by late November and ready for winter,” said Ted Morris, area manager for Birch Bay State Park. “We’ll work it over the winter and hopefully have it usable by this time next year,” he said. The project was envisioned by the Friends of Birch Bay State Park and is being paid for with private donations from the community. The largest donations came from BP Cherry Point Refinery and Alcoa Intel Works, which donated $105,000 and $25,000 respectively. From l., Kathy Berg, Ted Morris, Stacey McDaniel, Scott Walker and Darrell Hillaire don hard hats and use their golden shovels to break ground as part of the ceremonial proceedings. “I didn’t know if I would ever see this day come,” Berg said. Close to 100 people gathered at the day-use area in Birch Bay State Park to celebrate the long-awaited groundbreaking of the BP Heron Enviromental Center on April 20. The Ross family (from l., Max, Mason, Marijka and Ken) admire the stuffed heron on display at the site. Mark Matzel, 4, of Custer, sees how he measures up against the blue heron. “He’s taller than me,” Matzel said. will be building the Heron Center in Fall of 2013. The business plan is to the right.